A 72-year-old man has died after a crash involving a car and a lorry on the A9 between Balhaldie and Dunblane. 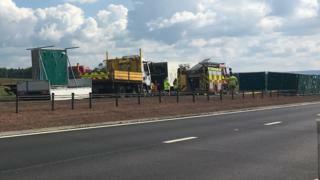 The man was a passenger in a Mercedes car which collided with an HGV at about 12:50 on Tuesday. The 71-year-old car driver was taken to the Queen Elizabeth University Hospital in Glasgow, where he remains in a serious condition. The crash happed a mile from the Shell Service Station heading towards Stirling. The road was closed for about six hours while police inquiries were conducted at the scene. Officers have urged anyone with any additional information to come forward. Insp Andrew Thomson, from Forth Valley's Road Policing Unit, said: "Our thoughts are with the family of the man who died as a result of this collision and Police Scotland will continue to provide them with all the support and assistance they require. "As part of our ongoing investigation, we are keen to speak with any motorists who were on the A9 on Tuesday afternoon and witnessed what happened. I am particularly keen to hear from drivers with dashcam footage who may have recorded the collision. "In addition, anyone with any other relevant information is also asked to contact police immediately."